Oomph! 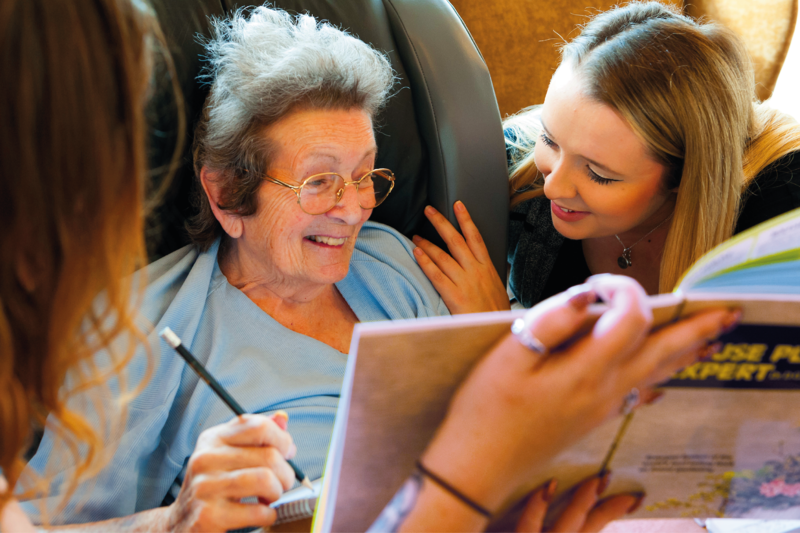 work in partnership with TLC Care Group, a provider of care homes across Herts, Surrey, London and Cambridgeshire, to train and support homes, with wishes and ambitions making up a key initiative of the programme. Derek, a resident at Carlton Court in Barnet, desperately wanted to return to Northern Ireland to visit his mother’s grave following her recent passing. The home learned of his wishes and commenced on a plan to make them come true for him. 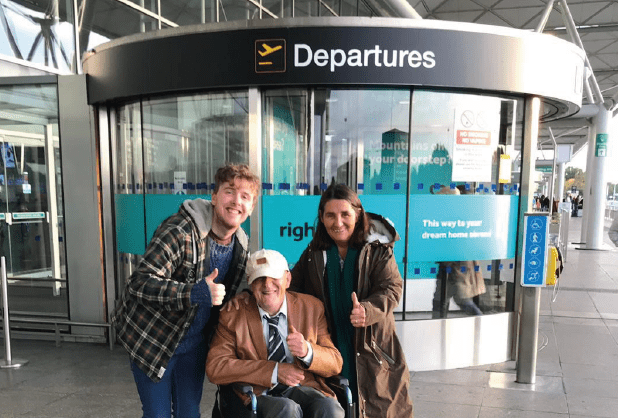 Steven Millar, an Activity Lead at the home, and Dee Osbourne, a Nurse at Carlton Court, put the wheels in motion to work together to make Derek’s dream a possibility. Steven booked flights from Stansted leaving at 9.40am and returning at 8.10pm. During their time in Belfast they took flowers to the grave of Derek’s parents, met with his brother and had a tipple in his local pub. Derek was able to fulfil his wishes and this meant the world to him, a truly life changing experience. To see a video of their journey, check out Carlton Courts Facebook page here. This World Alzheimer’s Day on Thursday 20th October, film crews visited Sutton Court where a special Oomph! exercise session was taking place to mark the day. 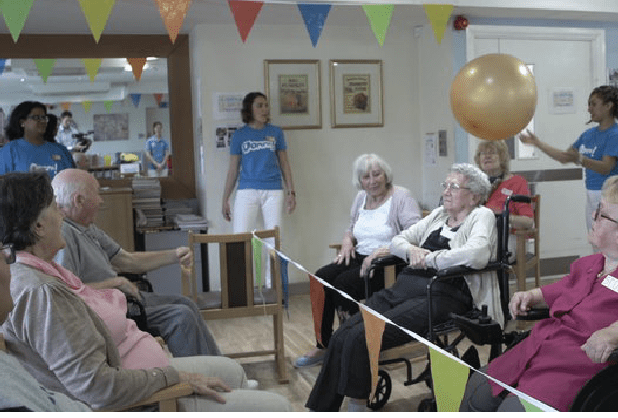 Shehzad Jivraj, Head of Operations at Clearstone Care, which runs Sutton Court, said, “Oomph has transformed the way in which activities and exercises are taken at our homes. Everyday when I walk around the home, I notice new and exciting person-centred activities and exercises and I see smiles on residents’ faces; these smiles are priceless. This has all stemmed from the excellent training, props, suggestions and assistance that Oomph! provides. These activities and exercises have improved the mobility, coordination, general health and mental health of our residents. We have also seen a rise in outings and external activities which the residents really do love, and again, many of these ideas have stemmed from discussions we have had with Oomph! Contact lisat@oomph-wellness.org for more information. Canford Healthcare gets some Oomph! with new wellbeing partnership! We’re excited to be partnering with Canford Healthcare, a successful UK Care provider, to deliver awesome exercise classes and creative activities for their residents. Taking a whole-home approach to activities, staff in Canford Healthcare homes have been trained in Oomph!’s Wellbeing Leadership programme. This will ensure that they are equipped with everything they need to create and sustain a person-centred plan of varied exercise and activities that residents love. The training is tailored to each home, and focuses on meeting and exceeding regulator requirements. The programme also includes a series of skills workshops, including Oomph! Relax, which has been developed in collaboration with expert practitioners of Yoga, Tai Chi and Pilates. The workshop focuses on teaching staff how to deliver flowing exercises, breathing and mindfulness activities to residents. Further workshops will focus on culture, nature and sport. Brian Cooney, Canford Healthcare CEO said, “At Canford Healthcare we understand the importance of activities to the wellbeing of our residents in order that they can lead full and engaging lives. We are working with Oomph to further develop key skills to ensure that our residents can maximise their enjoyment of life”. WCS Care gets some Oomph! with new wellbeing partnership! 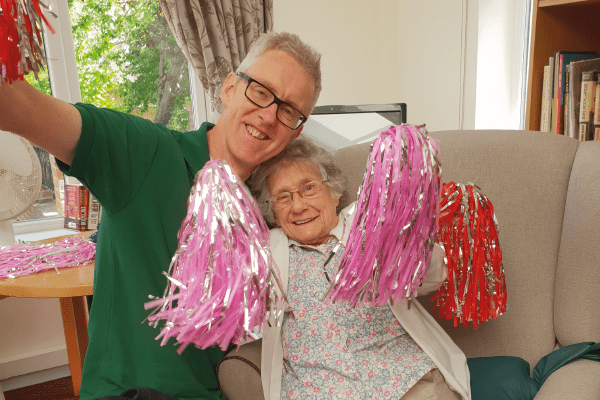 We are partnering with WCS Care, a leading UK Care Group, to deliver awesome exercise classes and creative activities for their residents, as well as engaging trips out. Taking a whole-home approach to activities, staff in 12 WCS Care homes have been trained in our Wellbeing Leadership programme. This will ensure that they are equipped with everything they need to create and sustain a person-centred plan of varied exercise and activities that residents love. The training is tailored to each home, and focuses on meeting and exceeding regulator requirements. The programme also includes a series of skills workshops, including Oomph! Sport, which has been designed in partnership with key national sports. These partnerships aim to make exercise as engaging as possible, to encourage inactive residents to take up physical activity and try something new – or rediscover lost passions. Additional workshops include relaxation, culture and nature. Residents are now able to play clock cricket, slipper soccer and armchair volleyball – sports especially adapted to fit the needs and abilities of residents, with the new content ensuring that exercise sessions are continually fresh and exciting. Additionally, Out & About trips are running for residents at 10 WCS Care homes, who are visiting a varied range of locations, spanning everything from arts and culture, to food and dining, to nature and the outdoors. Partnerships established with organisations such as the National Trust also mean that homes are getting out and about to beautiful houses, buildings and gardens in their local area. Popular trip destinations have included Coventry Transport Museum, a horse sanctuary and a butterfly farm. These trips out aim to connect residents to the people and places that matter most to them, so that they can reignite old passions – or discover new ones. One staff member said: “The residents enjoyed the trip out to the park! It was lovely weather and we saw lots of wildlife. We all chatted to people in the park and enjoyed some refreshments. The residents were very excited to be out in the warm weather’’. Christine Asbury, WCS Care’s Chief Executive, said: “Our partnership with Oomph! enables us to support residents with a wider range of opportunities, so they can continue to enjoy what they’ve always done or try something new.